Getting to Arran from the Central Belt is an incredibly easy process: Scotrail trains and Caledonian ferries have teamed up to synchronise their journeys, meaning that transferring from train to ferry and back is pretty much stress- and hassle-free, and is all covered by a single, incredibly cheap ticket (just over a tenner for a return journey). 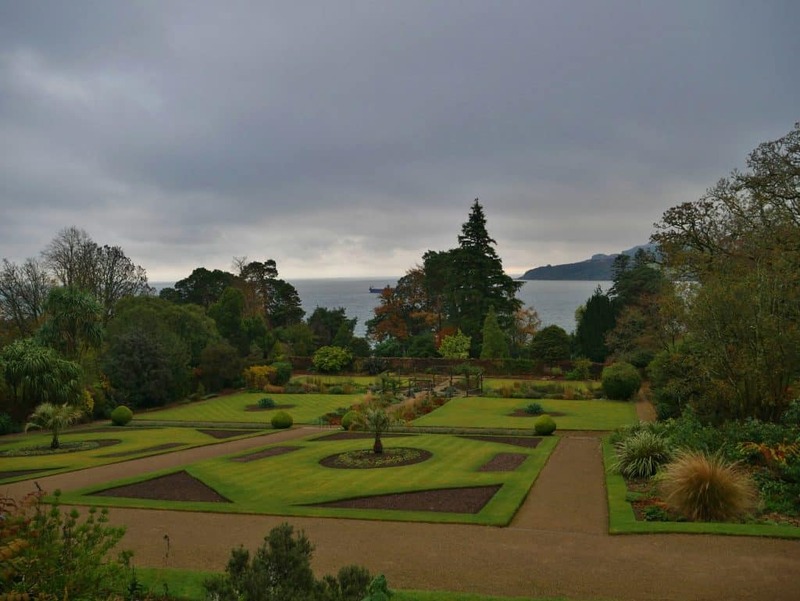 All in all, it usually takes as little as a couple of hours from taking the train in Glasgow Central station to your arrival in the small port of Brodick on Arran. From there, busses are once again synchronised to pick up ferry passengers and take them to the dozen or so towns and villages that dot the island, where all sorts of excursions are available: on top of dozens of walks, you can find caves, wildlife reserves, breweries, whisky distilleries, and golf courses all over Arran. In the summer months, when daylight allows for longer days out, you will get to spend up to eleven hours on the island before catching the last ferry back to the mainland, meaning that you’ll have more than enough time to take in one or more walks and still catch a pint at the brewery in Brodick, or wait for the ferry in one of the port’s many cosy pubs. And if one day’s not enough to cover your very own Arran bucket list, staying on the island overnight can be a lovely experience in and of itself (but more on that in a future post). 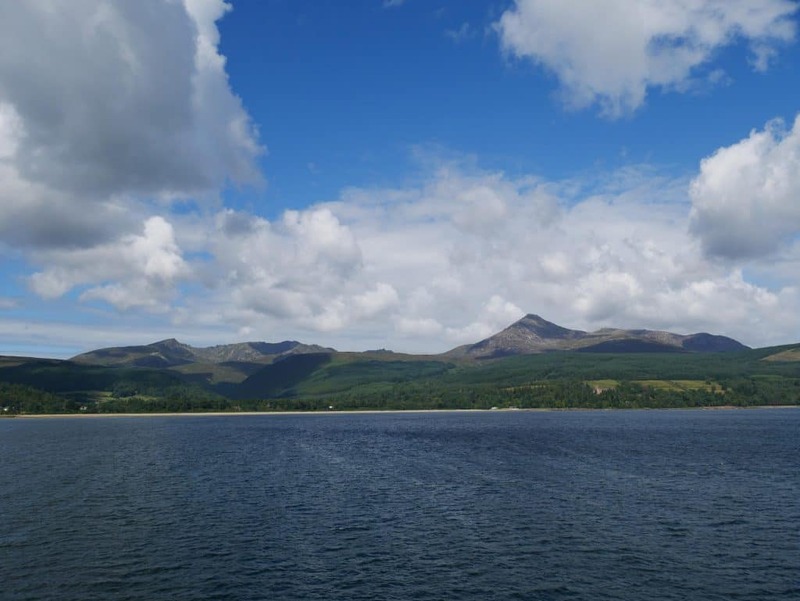 One of the many reasons this one is among my favourite walks on Arran is its easiness of access, as we start our journey right off the ferry at the Brodick terminal. 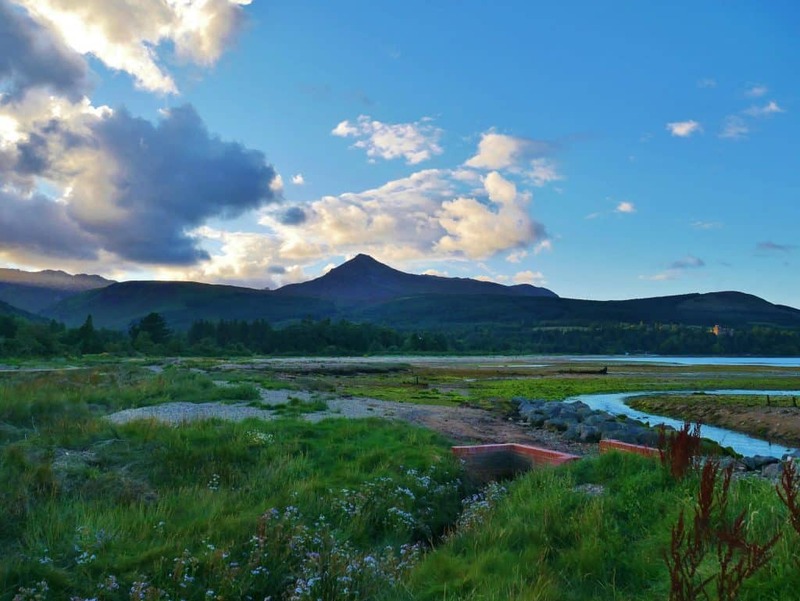 Strolling north along the wee town’s coastal main road provides an easy start to stretch your legs after your ferry journey, with easy paths and wooden boardwalks negotiating the bushy sand dunes of the aptly named Fishermans Walk until you rejoin the main road close to Brodick Castle. The short stretch of road to the entrance of the castle is a popular spot to catch a glimpse of the many seal colonies that inhabit the island in the summer months, and looking back you can see across the bay your ferry starting its journey back to Ardrossan Harbour. Taking the road going up to Brodick Castle, the lush and exotic gardens surround you with rhododendrons, giant ferns, and ancient conifers. While not part of the walk per se, taking a detour to visit the gardens in more detail is well worth it (especially if you’re not pressed for time), particularly on Sundays as the castle is closed to the public, and the access to its gardens is therefore free. 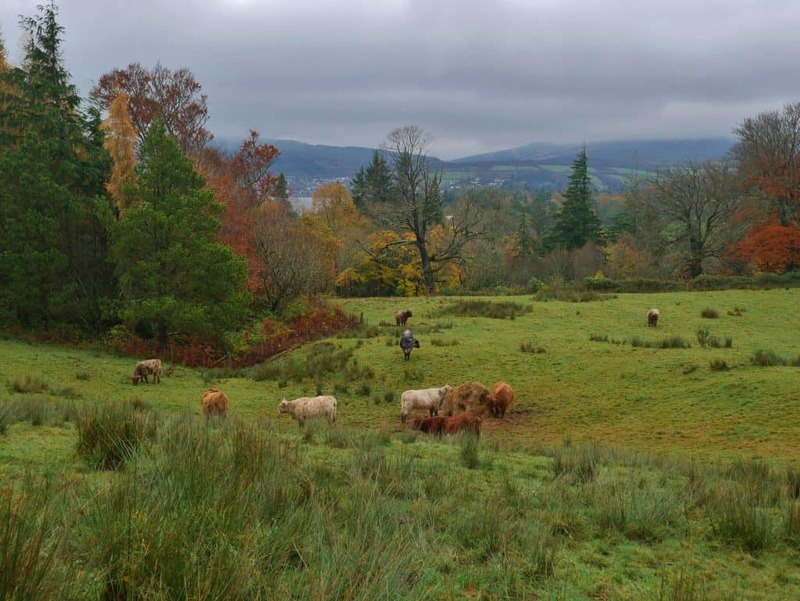 Continuing through the castle grounds to the back of the property, you then catch a road winding its way past cottages and pastures where you will be greeted by a gang of colourful Highland cows. This is where you leave the tarmac behind and can start your ascent through lush forestland, where a nicely shaded path follows a gurgling stream beneath. After a brief walk under the shadows of a massive pine grove (a more or less enjoyable experience, depending on how you feel about walking about in what looks like a horror film setting), the path opens up to a spectacular view of the glen. With the Goatfell range towering to your right and a small stream barely visible at the bottom of the gully to your left, it’s easy to feel like you’re carrying the Ring through the Dead Marshes as your boots sink into the muddy footpath making its way through the moory hill. 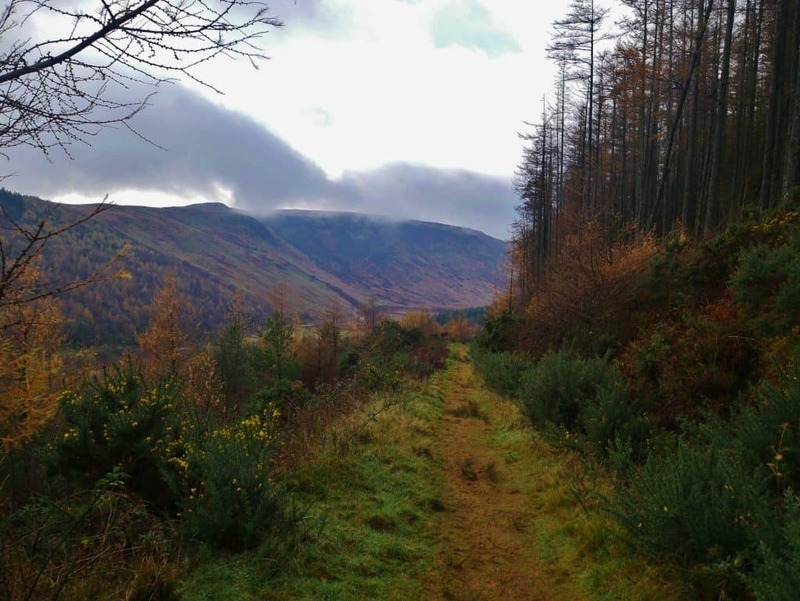 Depending on the weather, you’ll either be treated to brightly-coloured views of the hills around you and, in the distance, the snow-covered tops of Arran’s highest peaks, or the more dramatic, almost gloomy, sight of low-hanging clouds and mist wrapping the hilltops and quieting your surroundings. Depending on the season, rabbits and red deer can be seen hopping about the slopes around you while golden eagles fly in circles above your head. As you keep making your way along the hillside, the back of the glen starts to appear around the corner and, even though you’re only a few miles from Brodick at that point, it’s easy to feel like you’re much further away from civilisation. After a while, the path makes its way down to the gully where a bridge crosses over to a wider, usually dryer path that takes you back to the entrance of the glen. This path follows the bottom of the glen, close to the river, and is framed by lush patches of ferns and heather where butterflies, dragonflies, and other buzzing insects abound in the summer. Finally, the path turns back into a road as you reach the Glen Rosa campsite, a quiet section of grassy slopes close to the river where you can pitch a tent for the night for a fiver. While midges (Scotland’s very own microscopic biting swarms of terror) are a pain there in the summer, it’s also a gorgeous spot for stargazing on clear nights. At that point, all you have left to do is make your way back to Brodick along a quiet country road. The whole walk can take up to three or four hours from the ferry terminal and back if you’re a wildlife and photography enthusiast, so depending on time you can stop on the way for a pint in one of Brodick’s many pubs, relax along the beach, or catch a bus out of town to go sample some of Arran’s very own whisky at the distillery in Lochranza. Overall, this is my go-to walk for first-time visitors to Scotland for many different reasons: the insular location and variety of landscapes that this easy walk takes you through means that it provides a near-perfect snippet of what Scotland has to offer to first-time walkers. Since it’s close enough to other walks and attractions, keen walkers can easily shoot off to another walk with plenty of time to spare, and more relaxed visitors can enjoy a dram of whisky or a pint of the local brew to complete their taste of the Scottish way of life. And with the proximity to the Goatfell range, why not give the 874 metre ascent to Goatfell, the highest point on the island, a go? Worry not, there’s a pub at the end of the walk there too. Never forget that weather can be very unpredictable in Scotland. This is even more true on islands, where it’s not unusual to experience all seasons in one day. Always bring enough warm clothes with you, even in the summer (my rule of thumb is at least two extra top layers in my bag, even for short day walks), and always pack waterproofs, even when the forecast doesn’t show any signs of rain. It’s also a good idea to check the weather over a few days prior to your walk; heavy rains will make the path down the glen very boggy, so pack your waterproof boots and gaiters! Should the weather be unexpectedly warm, make sure to pack enough water too. 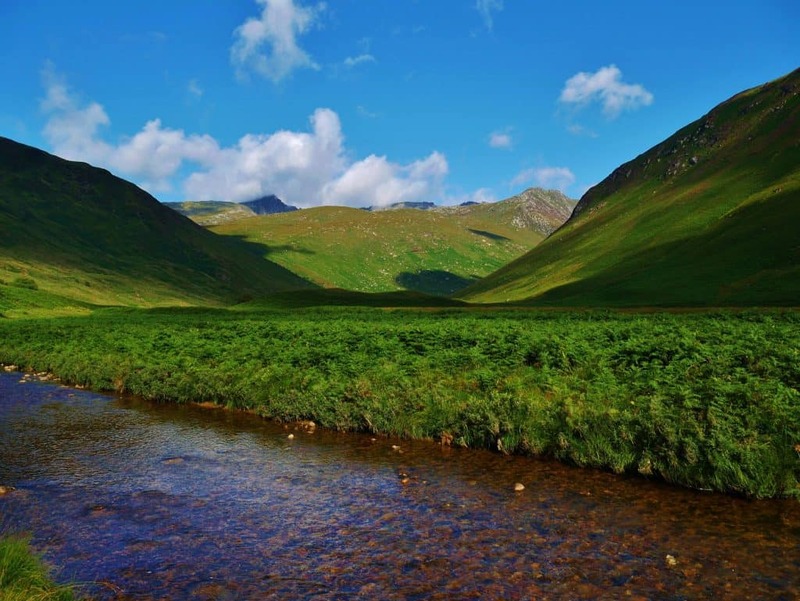 Water in Scotland is usually reputed for being pure and clean, but owing to the amount of sheep and cattle roaming the hills around the streams it’s best to use purifying tabs if you need a refill. Because this walk is quite short and easy, it’s particularly good for wildlife enthusiasts and photographers, as you can afford to spend a lot of time stopping along the way. So pack some binoculars and your biggest camera lenses to take a closer look at all the wildlife you can encounter. Always make sure to time your walk right. Walking at a rapid, steady pace, the whole loop can take just over two hours. 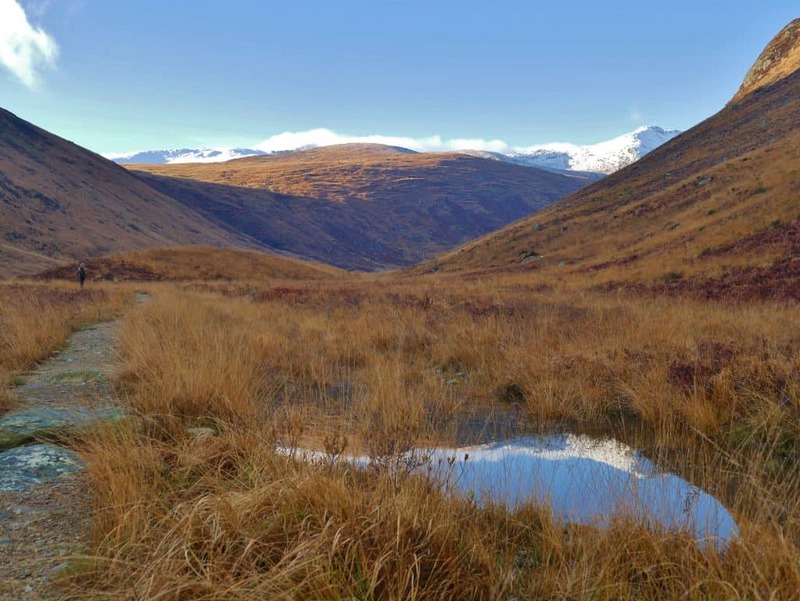 Because most of the walk goes through the glen, keep in mind that you will be losing daylight quickly, especially in the winter, as the surrounding hills shadow the sun well before sundown. While the retuning path along the bottom of the glen is flat and easy enough to navigate at twilight, you don’t want to find yourself navigating the more treacherous and boggy path into the glen without enough light.